Well… I told myself no more shop hops until I finish my existing projects… but then I decided maybe I wanted to make a Row by Row quilt. 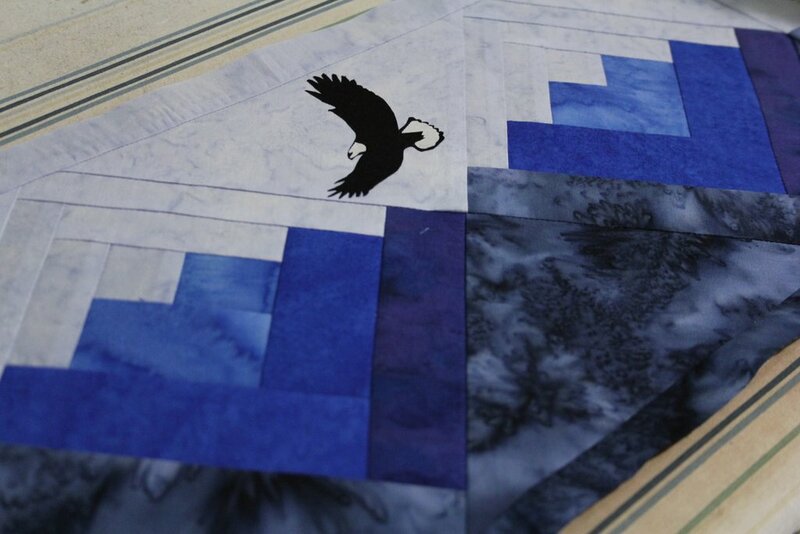 Row by Row is a program where participating shops (across the US and Canada) each come up with a pattern for a row. Each row is a standard size (9 x 36). I think it’s a great size for wall hangings and table runners too! The 2015 theme is water– so the blocks all have rivers, snow, fish, etc. You might not know this about me but I love all things water! I love to swim, I love the Great Lakes (and ok, oceans), I love mermaids, and even my job pertains to clean water! 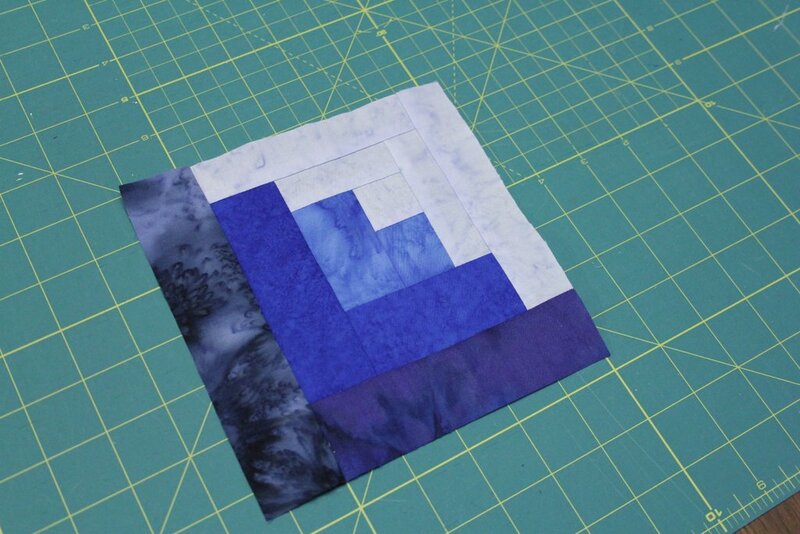 Here’s part of the first block I did. 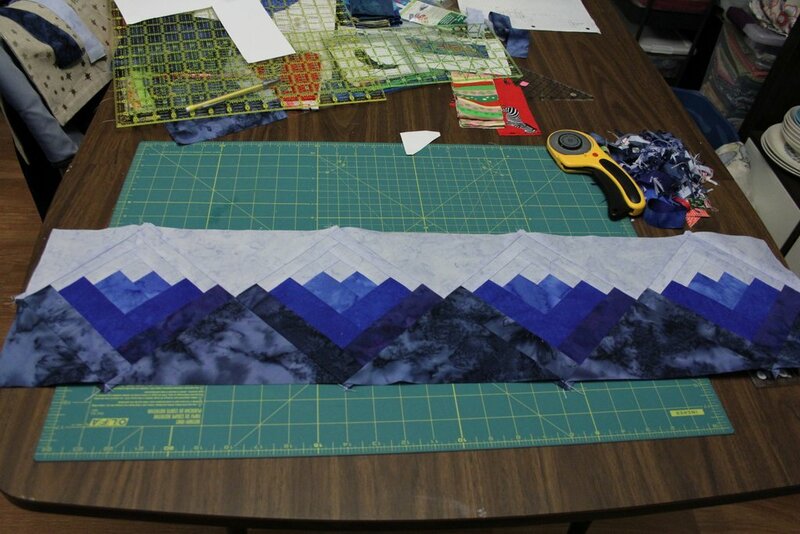 There are pieced blocks and applique blocks but pieced blocks are my favorite! This one is made of “curvy log cabin” blocks. There’s a ruler you can buy… but you know me and rulers/templates! I set out to figure this one out on my own. It’s called curvy because unlike a traditional log cabin block, where all the strips are the same widths, there are narrow strips and thick strips. It’s not easy to see here but it makes something pretty close to a quarter circle. So people make circles and ice cream cones and all kinds of curvy-looking things out of these blocks. I think I did ok, but the instructions called for a 6-inch curvy log cabin block, so I made it 6″ finished… and the corners ended up getting chopped off! They must have meant 5.5″ finished, 6″ unfinished. I should have gone back and changed the setting triangles (or noticed the problem before this point), but it was a kit and I really didn’t have enough to go back. Anyway, most people won’t notice but it made me wonder if I should have gotten the ruler after all (but I have one less ruler in my stash so I’m still ok with it! ).